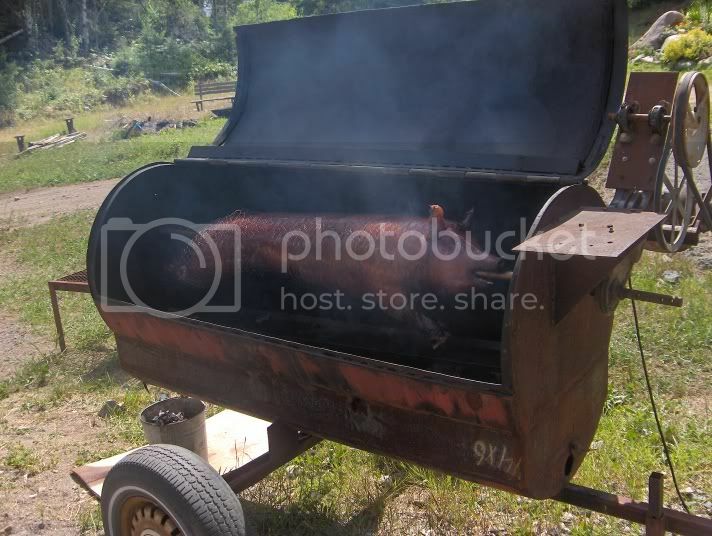 Looking for plans to build a rotisserie for whole hogs | Smoking Meat Forums - The Best Barbecue Discussion Forum On Earth! Discussion in 'Slicers, Grinders, Tools, Equipment' started by prplptcrzr2003, Sep 8, 2006. Thanks for sharing this, Cheech. I heard that this happens - someone told me to try wrapping the hog with chicken wire. But after all is said and done, I am taking a whole new approach with this. I'm canning the rotisserie idea for now. We've always had good results putting the pig between two pieces of remesh and wiring them together. It makes it simple for two people w/ gloves on to flip. It seems that there's enough fat on a hog that continual self basting isn't necessary. Skewering and balancing the hog was a big hassle the two times I did it. But I must admit, the sight of a big hog all shiny and golden turning on a spit is a pretty picture. I have seen alot of pics on the internet where people use the technique you're talking about, Dickey. I was headed in that direction, but my wife found a good deal on 2 picnics - weighing about 19 lbs each and I will pick up about 6 or 7 slabs of ribs to roast on a cement block roaster I am currently putting together. I am just going to indirect cook them on a couple of oven racks from an old large oven - the racks are cleaned up really nice. Check out my post entitled "Pork For Thanksgiving???" I posted some pics of how this will be set up. boy, does that make you want to go into a feeding freny or what? 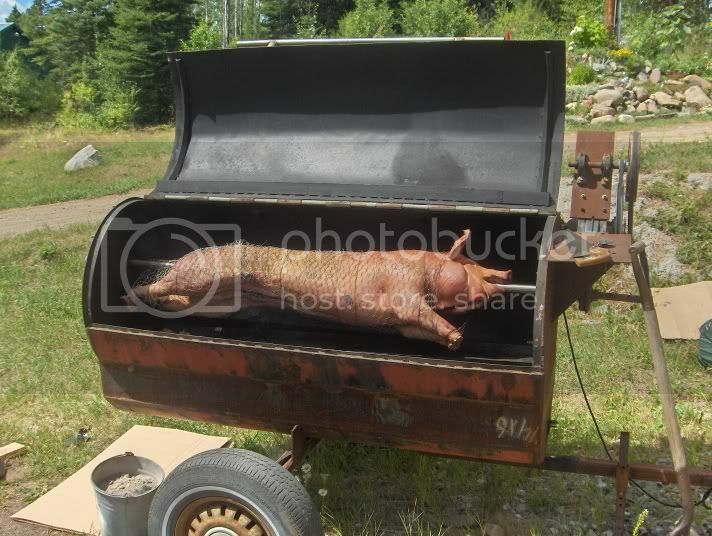 growing up as a kid every year we woulod roast a whole hog. the night befor we would lay plastic down on the garage floor bring in the hog from the butcher lay it down and spit it then wrap it in chicken wire and tie it up. even built a roster may years ag for a guy. the biggest thing to remember is to use a good size rod for your spit, good pillow block bearing on the ends and a good gear reduction gear box. then even if it's not ballanced right it doesn't matter she will still turn especially when you have it locked in with hooks on the spit shaft. Seen it done using the motor and gear reduction unit from a commercial overhead door (the motor may have been replaced with a higher service life motor, or maybe that was another project) At any rate Heavy duty is the only way to go. Chicken wire or cotton string tied as a net. Don't just think pig, think laaaaamb too. As mentioned before, you don't really need a spit, there are other ways, but a spit is definatly one of the best presentations and makes for one memoriable event for your guest. Built a mobile spit 20 years ago from a haywagon. Cut a propane tank in half lengthwise, welded it together into a long pit, added legs and bolted to the haywagon. Welded angle iron on each end vertically, cut slots in it for the rod. Got a 16' Stainless Steel 1Â¼" diameter rod and welded gear on one end, then hooked with small chain to a gear reduction motor that we vise-gripped to the angle iron to turn the rod, had bearings that fit into the slots we cut in the angle iron for the rod to turn on. We made two SS forks, 3 tong, welded to 1Â½" long pipe with wingbolt threads fitted to them to pull back and move forward, plus extention bars that went thru nuts welded to the tongs so we could do 4 or 5 top rounds at a time and keep them all turning at once. We did several pigs the same way, driving the extensions thru the hog which held it together while turning. We used slabwood from the local mill for fire/coals. We'd drive it to the site and start the fire and toss on the meat, then watch as everyone would stand around and drink beer, their heads turning with the spit constantly! I was thinking the same thing for my fire pit. I have friends that have had theirs for years with no real problems. Thinking a design through and ruggedness is the trick.